Datran's Modular design can best be illustrated in the following three drawings, which follow the Company's two-pronged approach to its broad target market. Solution for small businesses and startups that can expand as they grow by bolting on additional low cost Datran services. Solutions for large businesses that can significantly reduce their Total Cost of Ownership (TCO) over time, and at their pace. 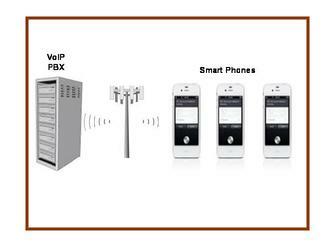 Designed specifically for the small company or startup that can't afford Internet access or VoIP telephones, and must rely solely on Smart Phones for communications between employees and customers. 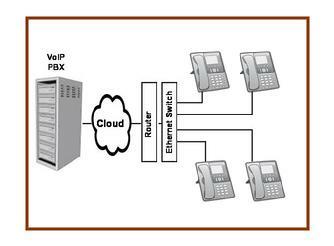 Converting to VoIP; however, you office is wired for legacy telephones, no problem. Datran can install one or more Wireless Access Points (WAPs) throughout your office and you can operate both VoIP telephones and computers in a wireless configuration. WAPs are much more reliable than the wireless access points found in routers. They operate simultaneously on two frequencies, typically have a throughput of 300Mbps or more, and conform to the high security standards required in the medical and payment card environment. For those businesses that already have Eithernet cables installed, or just perfer a hardwired installation over wireless, Datran uses an Ethernet switch instead of WAPs. A wired configuration has several other advantages: first, telephones utilize POE, or Power Over Ethernet cabling; and secondly, a UPS power system is provided that will keep the telephone network operational for at least 30-minutes, in the event of a commercial power outage.